Chickweed is a little-known herb which has considerable nutritive value and a variety of medicinal and wellness uses. It has long been used as a reliable herbal tonic to strengthen the health of the frail and sickly and to improve overall health. This edible plant was mostly used by Native Americans for respiratory problems such as bronchitis, whooping cough, colds, and sore throat. What is known is that Chickweed is a great source of vitamin C, calcium, magnesium, and potassium. Chickweed is said to be a healing herb that relieves pain in addition to stimulating healing, and it not only decreases pain but also helps reduce swelling such as with torn ligaments. It has been used both internally and externally throughout history to stop bleeding in the stomach and bowels. 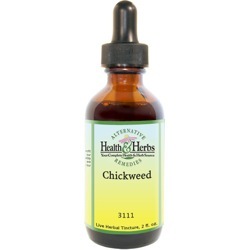 Chickweed extract is an excellent acne wash and found to be useful in the healing of sores, rashes, boils, and burns. This herb is excellent for blood vessels and your circulatory system. Taken internally, it helps to purify the blood and carry out toxins and has even been known to help with blood poisoning. It is also believed to help dissolve plaque in blood vessels, as well as dissolving fatty tumors and substances, then removing them from the body. Chickweed is well known for helping with weight loss and actually works as an appetite depressant. Modern herbalists use Chickweed tincture to treat joint pain, eczema, psoriasis, rheumatism, gout, blood diseases, eye inflammations and hemorrhoids. Chickweed may aid in digestion and help reduce symptoms of bladder infections, indigestion, peptic and gastric ulcers. It also acts as a diuretic and a mild laxative that may help to relieve symptoms of constipation. The humble Chickweed is still used by herbalists to soothe the inflamed tissue of sore throats, coughs, bronchitis, pleurisy, hoarseness, chronic cough, nasal congestion, colds and other viral infections. Chickweed is a demulcent, which means it produces mucilage that helps to soothe and protect tender and inflamed tissues. As an expectorant, Chickweed leaf soothes bronchial spasms and eliminates mucus by supporting a productive cough. This herbal tincture can have an enormous effect on asthma and allergy symptoms, even smoker's cough, by moisturizing and soothing the membranes of the throat and lungs, while at the same time disarming toxins and bacteria. As a diuretic, Chickweed is believed to stimulate the kidneys and promote urine flow. Along with its antibacterial properties, it has been useful in relieving urinary tract inflammations, including cystitis and vaginitis, as well as the elimination of excess water, toxins, and chemicals. The herb is also good for blood vessels and circulatory system. Taken internally, it helps to purify the blood and it has been used by herbalists for impotence, or erectile dysfunction and diabetes. Chickweed purifies the blood and kidneys as well as, calms and cools a troubled digestive stomach, easing constipation, hemorrhoids and stomach ulcers. It has a mild laxative effect on the body, so don't overdo it. The benefits of Chickweed leaf may be traced to the presence of gamma-linolenic acid or GLA. This fatty acid is effective for gastrointestinal complications, skin irritation, and inflammation. It has been used for skin ailments, such as psoriasis, eczema, blisters, and ulcers The herb's anti-inflammatory properties help alleviate arthritis discomfort, stiff neck, and stiff joints. Chickweed leaf liquid extract is believed by herbalists to assist the body to eliminate mucus and fatty plaque from the system, as well as address fat accumulations, possibly helping to dissolve fat deposits and benign fatty tumors (lipoma). Chickweed's properties cleanse and rejuvenate the body while nourishing it at the same time. It is a positive herbal extract for weight loss, as it helps the body dissolve and rid itself of excess fat cells. This ability to break down fat molecules may result in fat loss. It also works as an appetite-suppressant, digestive aid, and diuretic. The flushing effect acts as a natural detox agent, which may hasten the rate of weight loss. Due to its ability to cleanse the blood and has been used to treat all forms of cancer and tumors. It has also been used in a poultice for abrasions, sore eyes, and swollen testicles. Chickweed is renowned for its ability to cool redness and speed healing, for internal and external flare-ups of the skin. It has been commonly used to treat adolescent acne, bruises, cuts, wounds, sores, warts, carbuncles, ulcers, boils, itchy skin, rashes, burns, and abscesses. Ingredients: Chickweed Leaf, Structured Water, 20% Alcohol. Non-Alcohol extract: Chickweed, Structured Water, and Vegetable Glycerin. Contraindications: Excess consumption may cause vomiting and diarrhea. Use of this herb is not recommended during pregnancy or breastfeeding. From Anonymous of New York, New York on 11/9/2015 . From Nikki Kaminski of Lake ORion, Michigan on 12/24/2012 .